1 of 7 Heat broiler. 2 of 7 In a bowl, toss peppers and onion with 1 tablespoon of the olive oil. Coat broiler pan with nonstick cooking spray; broil peppers and onion for 10 minutes or until lightly charred, stirring every 3 minutes. 3 of 7 Remove from oven and place peppers and onions in a medium-size nonstick skillet over medium heat. Add capers, 1 tablespoon of the chopped olives, red wine vinegar and 1 teaspoon of the olive oil. Heat 1 to 2 minutes, remove and stir in basil, parsley, 1/4 teaspoon each of the salt and pepper. Place in a bowl and set aside. 4 of 7 Sprinkle chicken with remaining 1/4 teaspoon salt and pepper. 5 of 7 Heat remaining 1 tablespoon oil in a large nonstick skillet over medium heat. Add chicken; cook 7 to 8 minutes per side or until browned and internal temperature of chicken registers 160 degrees F on an instant-read thermometer. 6 of 7 Remove chicken from skillet and cool for 5 minutes. Spread each breast with a heaping tablespoon of remaining chopped olives. Slice chicken across the grain into 1/2-inch slices; set aside. 7 of 7 To serve, place 1 cup greens on a plate and top with the pepper mixture. 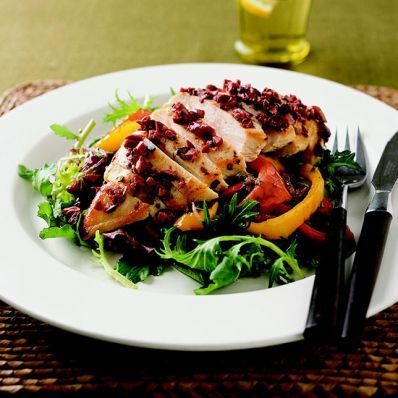 Place a sliced chicken breast on top and drizzle any remaining juice from the pepper mixture over it. Per Serving: 15 g Fat, total, 99 mg chol., 2 g sat. fat, 6 g fiber, 1018 mg sodium, 387 kcal cal., 43 g pro., 20 g carb.